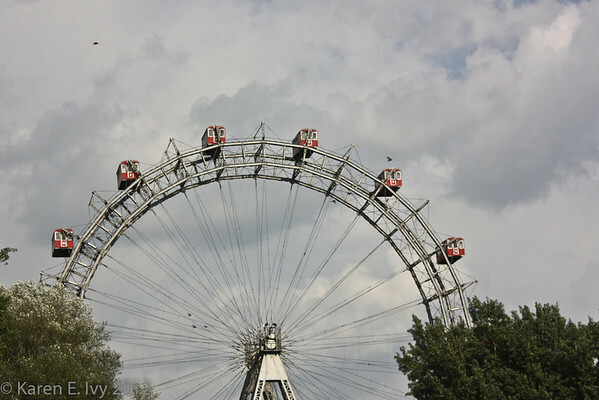 Well, not entirely – but a good deal of our “Vienna city walk” was done on a bus, hence the odd things that sometimes appear in my photos. You’ll only see the ones I could reasonably salvage. 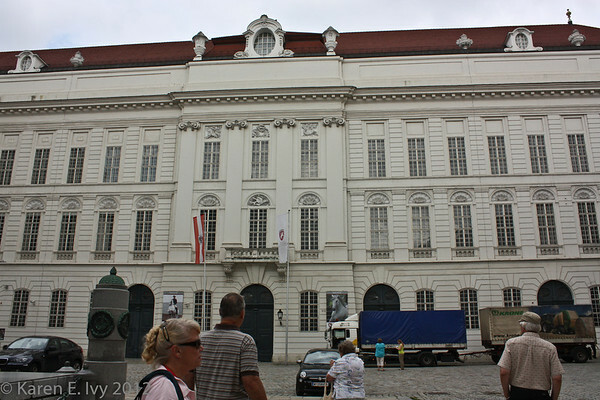 If you just want to go look at photos, you’ll find the Vienna gallery at this link. 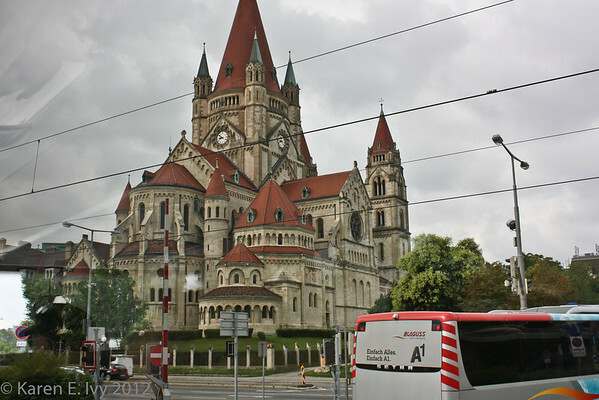 Also known as the Kaiser Jubilee Church and the Mexicokirche, it was built around the turn of the 20th century to celebrate the 50-year anniversary of the reign of Emperor Franz Joseph I of Austria, and consecrated in 1910. I was interested because of the combination of church styles: all those round arches are very Romanesque, and yet it has a handsome set of flying buttresses, usually associated with the later Gothic style. The bus turned a corner, and we continued our tour. The next thing we saw was quite exciting to anyone who has (as we have) seen The Third Man. The clouds you see here may give you the idea that the day was cool; and you’d be wrong. 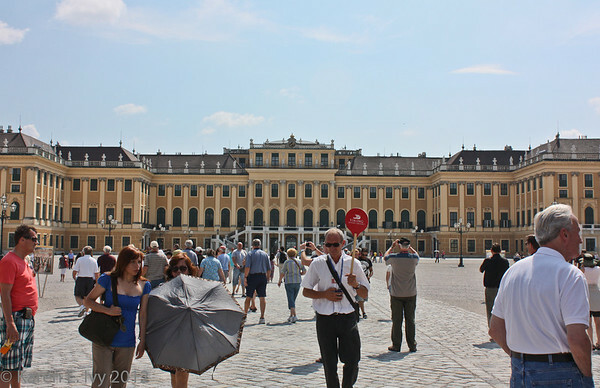 I remember that day as stifling hot, especially in the afternoon when we toured the Schönbrunn Palace grounds. I nearly got heatstroke walking around. The morning wasn’t as bad as the afternoon. 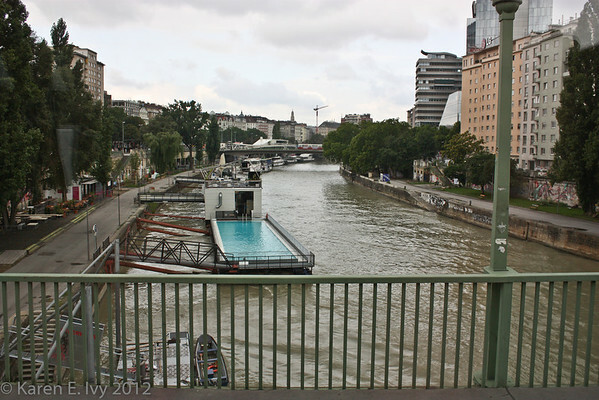 Our bus crossed the Danube Canal, which is an old branch of the Danube, and we had to look twice to see that yes, that really is a swimming pool on a barge floating on the canal. It’s called the Badeschiff. I never got an explanation of this at the time, but the Internet tells me this is a popular swimming spot, complete with a bar and restaurant (regrettably called the Holy Moly). The building is huge and impressive, I couldn’t get a good angle on it, and I have a reflection from the bus window. A few minutes later I got a better shot from the side, still from the bus (see the seat top? 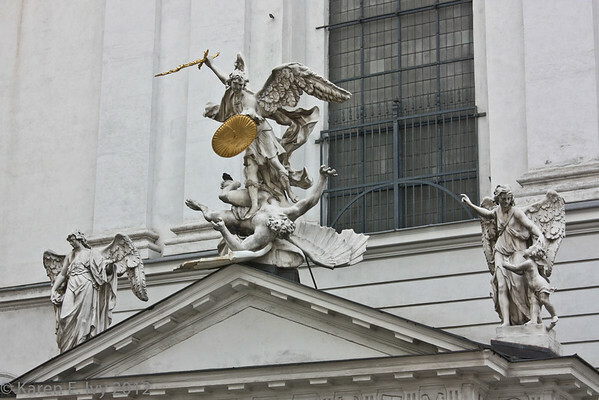 ), so you can see the amazing statues on the roof. 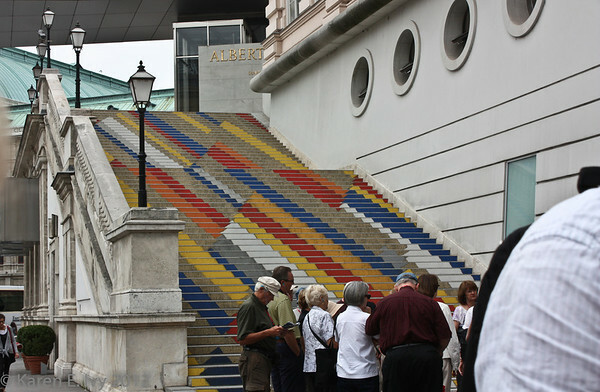 Everyone who comes to Vienna ought to go there at least once. I believe it’s terribly glamorous, and it’s certainly typical of old Vienna, you know, baroque and gilt and red plush and the good old days. 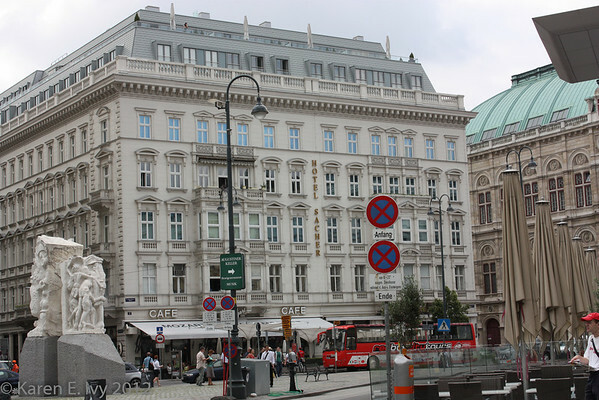 It was started by a Madame Sacher, ages ago, sometime in the nineteenth century, and I believe it’s still fairly humming with the ghosts of archdukes and generals and all the Viennese high society at the time of the Hapsburgs. I think I even read something in a guidebook about an archduke or something who went there for a bet in absolutely nothing whatever except his sword and maybe a few Orders. We didn’t, I regret to say, get to go into Sacher’s even for a look around. Our tour guide had serious ground to cover. And we had to hear about the burial customs of the Habsburgs. I admit, I thought the guide made this up, but I’ve since looked it up on the Internet and it seems to be true. When a Hapsburg died, they ceremonially removed the heart and the viscera and put them in separate urns. The heart urn was stored in the Augustinian Church (this is where they got married, so I suppose that makes sense), the urn with the viscera was stored in the catacombs of St. Stephen’s, the Dom. The rest of the body was coffined and stored in the Capuchin Cloister, after a prescribed “knocking ritual.” All this was used as recently as 2011 to bury Otto von Habsburg, the late Emperor Karl’s last son. 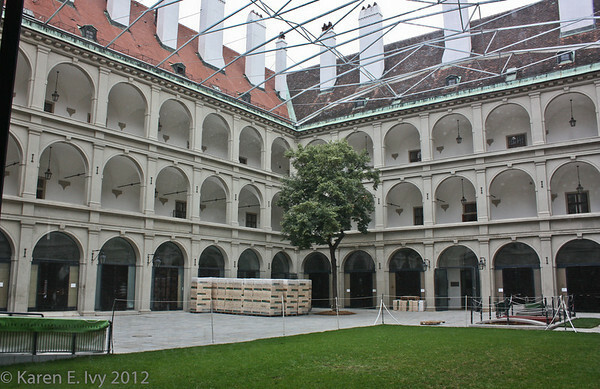 Just to show you that everything in Vienna is in the same architectural style, here is something I didn’t quite expect to look like this: the stables of the Austrian Riding School. That’s right, this is where the Lipizzaner stallions live when they’re in town. I don’t know if they actually keep the horses on the upper stories or if those are just for administrative offices, and there wasn’t anyone I could ask, not with my rudimentary German. But those ground level arches are definitely horse stalls – or loose boxes. And amidst all this baroque grandeur, the ruins of the Roman outpost this once was. They fortified the spot in 15 BC and called it Vindobona. The street was created at around 1220, when duke Leopold VI expanded the town and had the moat, which dated back to the Roman era, filled in. Hence the street’s name, which can be translated to ditch or trench. Most of the buildings are 19th century. 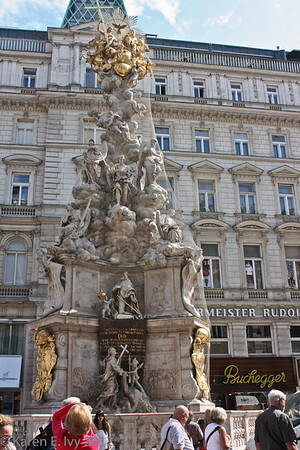 The center of the Graben is the Pestsaüle or Plague Column. A lot of European towns have a plague memorial of some kind. This was erected after the last major European plague epidemic in 1679; it was originally just a large cross, later replaced by this more elaborate monument, commissioned by the Emperor Leopold I. Vienna lost approximately 100,000 lives in that epidemic. 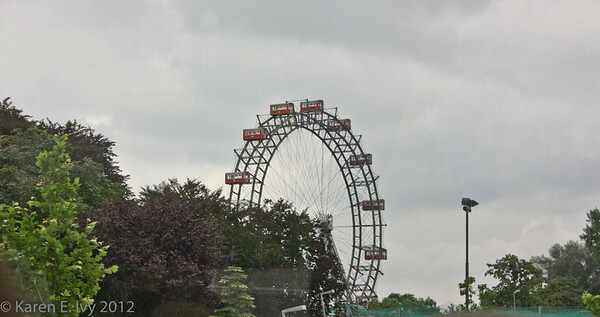 After the Graben, it was back on the bus to go out to the Schönbrunn Palace. Before we left the city, I got a wonderful shot of a horse-drawn tourist carriage, closely followed by a bus. Note that the horses have earmuffs as well as blinders – probably to reduce the impact of traffic noise. I’ve never seen horse earmuffs before. On the way out of town (naturally the Emperor lived outside the city!) we passed a couple of other sights, one historic, one just odd. 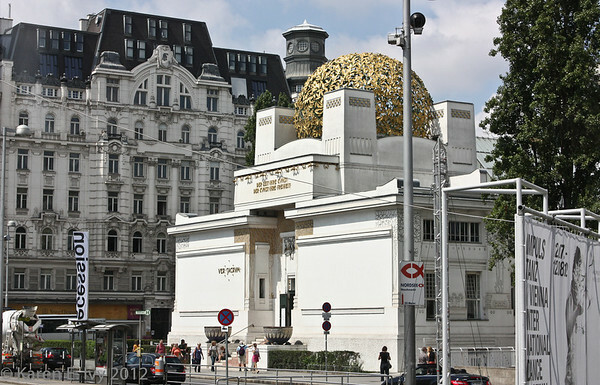 The historic site was the Secession Building, built in 1897 by Joseph Maria Olbrich as an “architectural manifesto” for the Vienna Secession, a group of artists who felt that the Association of Austrian Artists, housed in the Vienna Künstlerhaus, was too conservative. Gustav Klimt was the first president of the Secession, which should tell you something about its artistic style. Since I only saw it from the bus, I was very lucky to get this good a picture. The odd thing I saw was also from the bus. We stopped at an intersection, and I suddenly realized that the building on the street corner had a statue on the corner of the building, which looked much older than the building itself. 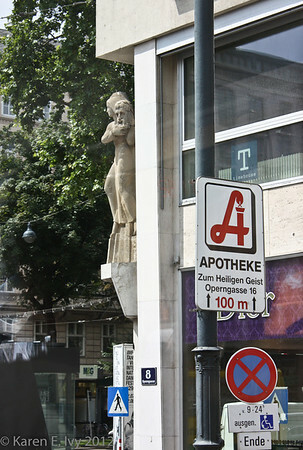 I thought the building was a drugstore (Apotheke) but I just realized the sign is on the post and says the Apotheke is down the street. So this ordinary modern structure has a little pedestal with a statue of a woman in a long dress, holding the head of a bearded, long-haired man. What? I couldn’t see any kind of sign, but it has to be either Salome with the head of John the Baptist or Judith with the head of Holofernes. How would you like to walk past that on your way to work every day? I recall that the temperature was hovering around 90° F with humidity to match; thank God the Palace interior is air-conditioned! Most of the fittings are original; the guide said the candle holders were wired for electricity – by Thomas A. Edison! Yes, that one. Every floor in the Palace has a different parquetry pattern. 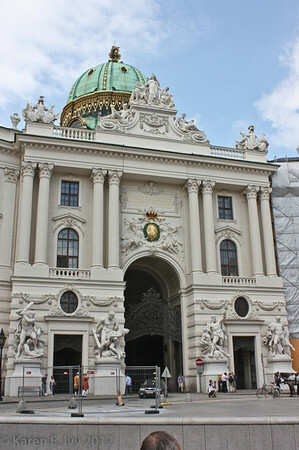 Our guide told us that qualifying to lead Palace tours requires two years of college – essentially an AA degree! Schönbrunn Palace is not as glitzy baroque as some other places we toured, but this is where you get the Hapsburg history. 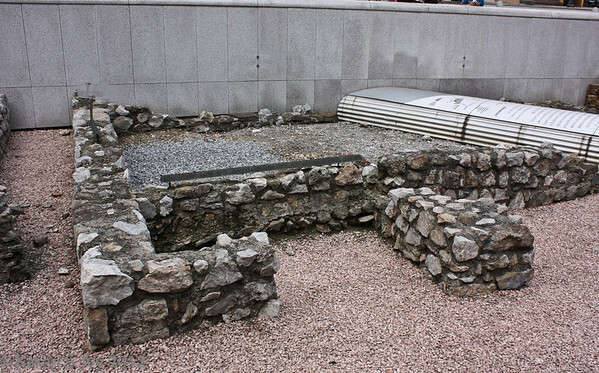 Also, this was clearly a home; people lived here. It was never clear to me at the Prinz-Bishop’s Residenz in Würzburg that anyone lived there, in the sense of putting your feet up on a footstool and reading. It was all ceremonial. 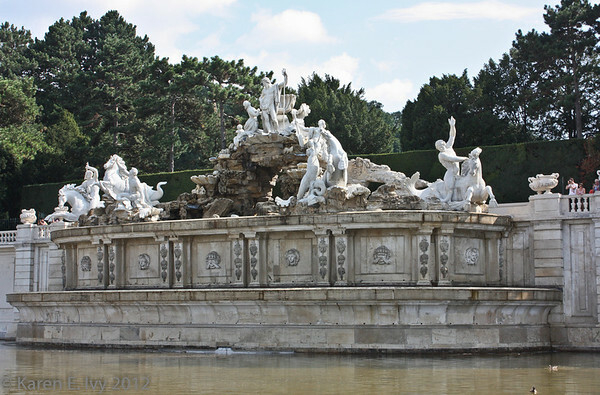 But Schönbrunn Palace was home to the Emperor Francis I and Empress Maria Theresa, and the sixteen children she bore him. If that looks like the fountain is a long ways off, it is. And no shade. (Ladies, of course, carried parasols.) 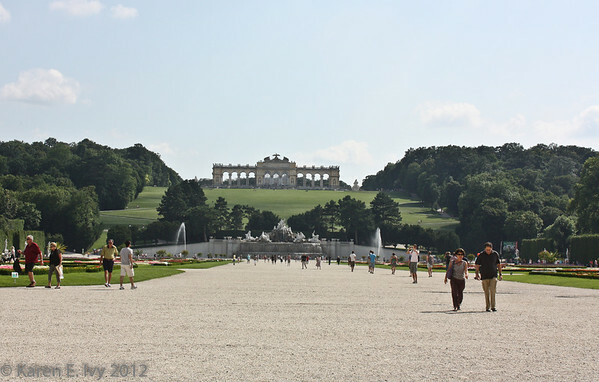 The thing on top of the hill is the Gloriette. I guess it’s where they went for picnics. By this time we’d shed the guide and I was too tired and hot to read the brochure. And in the heat, I simply couldn’t face the climb up, although the Palace web site says there’s a glassed in cafe in the middle. I did get far enough down to photograph the Neptune Fountain, which has way too much going on. If you’re interested in the background on the gardens and fountains, go to the official Palace web site and learn more than you can stand to know. 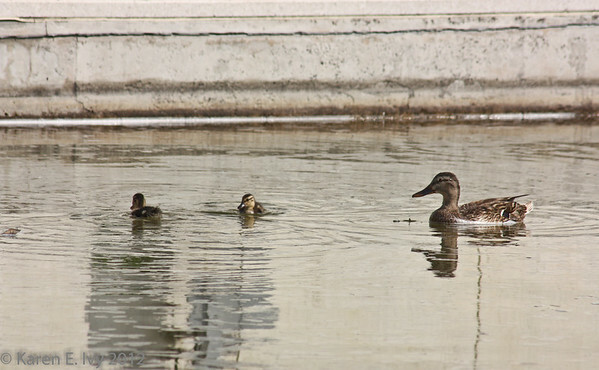 I did appreciate the ducklings in the Neptune fountain. 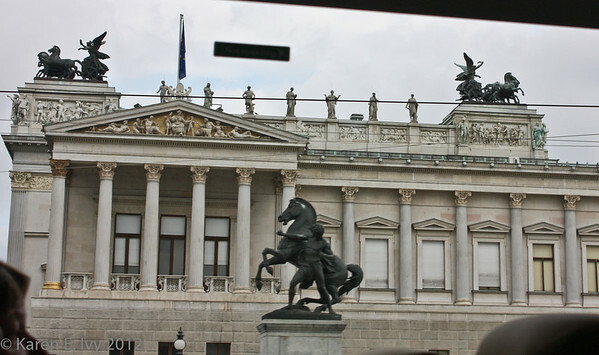 After touring the Palace and gardens, we hustled back to the boat and ate a very rapid dinner, because we were going to a classical music concert that night, in Vienna, and we had to get back on the bus. 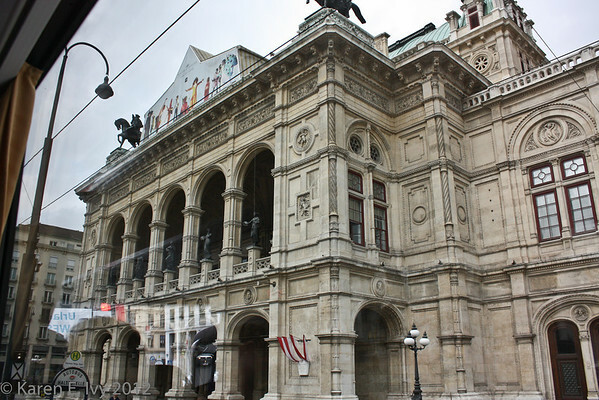 The Vienna Residence Orchestra was a chamber group. I count 7 music stands, so I’ll say it was about 12 players, some of them shared stands. The small stage on which they performed had just barely room for them and the singers and ballet dancers who performed with them. Here’s the room, before the concert, taken with my phone. The stage was very full indeed when everyone was playing and dancing, and the audience was full too. 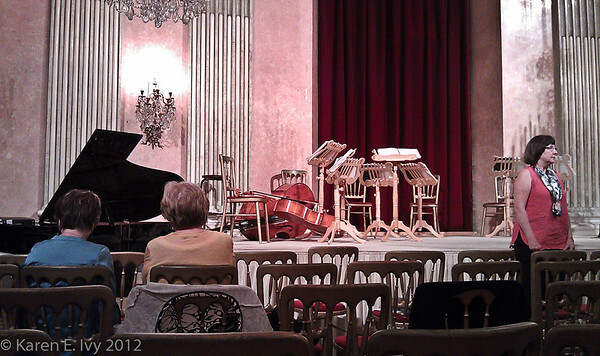 The acoustics were good and the music was good if a little mixed – Mozart and Strauss. Well, they’re both Viennese. Also the chamber players had a tendency to play over the singers. On the whole, I enjoyed it, but it made a very long day. It was also attended, as far as I could tell, only by passengers on Viking River Cruises ships! I saw no evidence of anyone attending this concert from Vienna, only the tourists. Weird. If this doesn’t seem enough for one day, we also had some time to tour St. Stephen’s Cathedral, the local Dom. That will be another post.